Kenedy Petty is the 14 year old daughter of Ryan Williamson and Jeri Petty. She resides in Sublette, Kansas where she is a freshman in Sublette High School. Kenedy is active in Rodeo, Reining Horse Association, 4-H, Basketball, and Volleyball. In early 2014 Kenedy started her own clothing and jewelry line with a Sony Nashville recording artist called Silver Wear USA. Kenedy is very hands on in the designing and marketing of Silver Wear USA and it will be on display at the South Point during the 2014 National Finals Rodeo in Las Vegas. 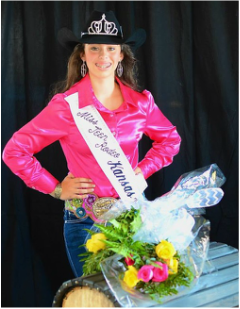 At the 2015 Miss Teen Rodeo Kansas Pageant Kenedy captured the Horsemanship and Rodeo Knowledge awards.